This hot dog incorporates everything you love about nachos and the goodness of Hoffy’s Bun Length Premium Beef Franks. Celebrate the opening of baseball season with this homerun hot dog recipe! Using a stovetop grill or your backyard BBQ, grill the Hoffy Bun Length Premium Beef Franks, turning often. Grill the buns until warm. In a small mixing bowl combine the Mexican Crema and adobo sauce. Stir to combine. Spread each toasted bun with the chipotle crema. Place a beef frank in each bun and top each frank with 1/4 cup of the shredded cheese. Dress each dog with a few slices of avocado, cherry tomatoes, pickled jalapenos, a sprinkling of crumbled Queso Fresco and the crushed tortilla chips. 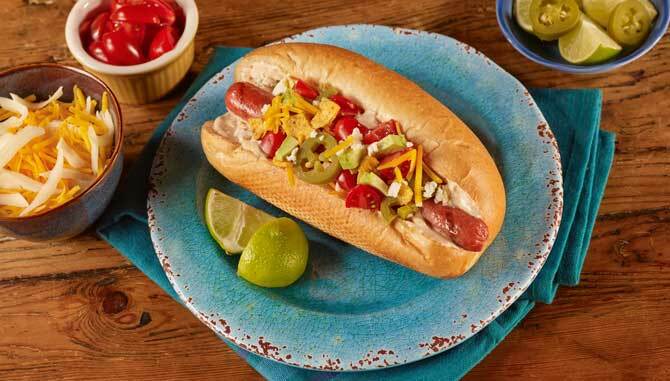 Squeeze a wedge of lime over each hot dog and serve.